When most people think of demolition they think of implosions of old buildings and loud noises. What they really don’t know is that demolition is a complex set of tasks involving structural dismantlement, site clearance, environmental remediation, salvage, recycling and industrial recovery. Demolition involves the use of hydraulic equipment with specialized attachments, cranes, loaders, wrecking balls and explosives. Interior demolition is the non-structural demolishing of spaces within a structure in preparation for reuse and upgrading of the space. This includes interior wall and ceiling removal, demolition of flooring and some utility services, salvage and selective structural demolition. The use of explosives to implode a structure is used because it is very effective and time efficient. It is a highly specialized part of the demolition process that requires an in-depth knowledge of explosives and the nature of structures. Implosions are done to clear space in that area for rebuilds on that specific site and its surroundings. Contractors who perform the site preparation and clearance work are usually licensed professionals. There is strategic placement of explosive material inside the structure and the timing of the implosion are key factors in explosive demolition. This is so the structure collapses on itself in a matter of seconds minimizing the physical damage to the immediate surroundings. You may be familiar or have seen implosions locally from when the old Gates Circle Hospital in Buffalo was torn down in 2015 or when you hear of hotels in Vegas being demolished to make new resorts. Industrial demolition is the dismantlement of structures or facilities used in the production of goods. The can be done at chemical plants, oil refineries, manufacturing facilities and more. It often involves environmental remediation of hazardous substances that were part of the industrial process and could have potentially contaminated the site. 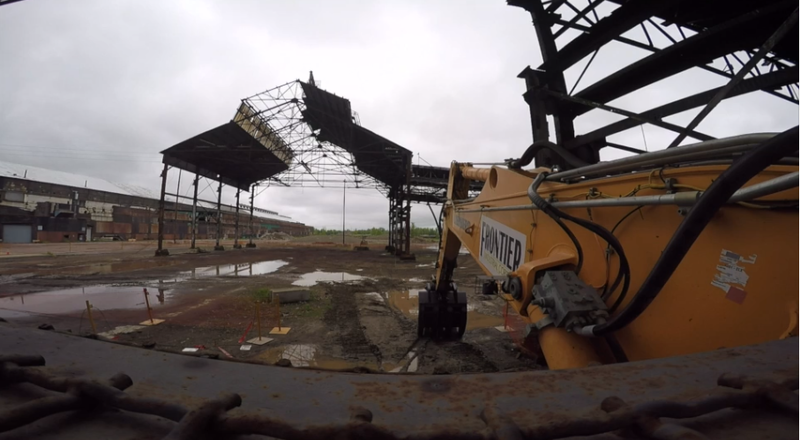 Industrial demolition can be a complex task involving sophisticated engineering, specialized rigging and complex industrial hygiene requirements. High reach units involve the use of super long boom arms with specialized hydraulic attachments mounted on excavator platforms. These units are designed to allow access to tall structures, often 20 stories or more, and safe demolition of the building within its surroundings. Commercial Demolition is the partial or complete dismantlement of commercial properties such as office buildings, malls and hotels. Deconstruction is the labor-intensive demolition of a structure in order to maximize the amount of potentially recyclable materials from a building. It involves a considerable amount of hard demolition and sort separation to prepare what components make up the structure. Demolition contractors are some of the most regulated construction industry professionals. They are often working on structures and buildings that are damaged by fire, weather or structural deficiency that require permit review by local municipal building departments. Demolition contractors deal with a variety of structures and the industry’s health and safety regulations are strong. Many states have their own health and safety rules and the Federal Government’s Occupational Safety & Health Administration’s (OSHA) Construction Standard (29 CFR 1926) contains a specific section on demolition operations. Demolition contractors often have expertise and knowledge in historic preservation. They know which structural elements can be saved and how to assure that the integrity of a historic structure can be preserved and maintained. Asbestos is an insulating and sound attenuating product that is used as pipe and ceiling insulation, sprayed-on fireproofing and many other uses in flooring, roofing materials and some cement products. Overexposure to asbestos can cause health problems and asbestos abatement, the highly regulated and safe removal of asbestos, is big part of demolition. PCBs polychlorinated biphenyls are an organic chemical used as an additive in transformers and capacitors in a structure’s electrical system. rail cars, heat transfer systems and some coating materials. The chemical is highly stable, has a low flammability and is excellent to sustain an electrical field. PCBs have a complex chemical make-up and are slow to breakdown in nature. This can cause some health issues. Proper handling and disposal of PCB-containing oils and fluids and PCB-contaminated equipment is a large part of the demolition process. A Brownfield is a contaminated site. often a small manufacturing, industrial or commercial site that has less hazardous or toxic substances than a highly contaminated site regulated under the Superfund law. Brownfields can be abandoned gas stations, dry cleaning establishments, warehouse or manufacturing sites that have small amounts of pollution that need to be remediated before demolition and reuse. A Superfund site is a highly contaminated site that contain high levels of pollution and regulated under the Superfund Law. We have one of these sites in our own backyards, Love Canal. Times Beach, Missouri and the Edison Laboratory site in New Jersey are other examples. The cost of these cleanups come through the chemical industry as a Superfund because the clean up of these sites are often a multi-year endeavor and involves a detailed team of demolition professionals including industrial hygienists, environmental scientists and highly trained remediation specialists. Demolition contractors make it a point to be good stewards of the environment. Demolition of outdated or damaged structures, environmental remediation of contaminated sites, asbestos abatement and soil and facilities decontamination enhance economic development in these communities. What is the US Green Building Council? The US Green Building Council (USGBC) is an organization made up of thousands of members committed to moving the building industry forward by promoting greater building efficiency. The goal of the USGBC is to enhance the quality of life by providing better, healthier places for people to live and work. They promote energy efficiency, recycling of construction materials and sustainability in the building process. The National Emission Standard for Hazardous Air Pollutants for Asbestos (NESHAP) says that friability is the ability to crush or pulverize, hand pressure, to determine whether potential asbestos-containing material (ACM) can become airborne and become respirable when it is handled or disturbed. If material is determined to be non-friable it may be able to be disposed of as non-asbestos containing, depending on individual state or municipal asbestos regulations. Demolition work involves many of the same hazards that happen at other construction sites. Lead-based paint, asbestos-containing metal and sharp objects are a few additional hazards that are involved with demolition. Employees should be knowledgable of how each piece of equipment works and what should be worn during demolition. Hard hats, masks, gloves and work boots are absolutely necessary for wearing during demolition. These employees should be trained, qualified and experienced enough to handle working on a demolition site to help precent accidents during the dangerous explosions and tear downs. Make sure all employees are wearing the proper equipment and that only authorized employees are present to clean up any debris once demolition is complete. Before demolition can begin it is highly recommended to go into each and every room and space to make sure that everyone and everything is out of the building. The building should be monitored by employees to make sure that any unauthorized people do not get close or inside the demolition site. If anyone needs to enter the building every ceiling and walkway needs to be braced to help provide extra support to help prevent accidents. Frontier Industrial Corp. is committed to protecting and promoting the well being of our workforce.